The renovation is complete, for now! 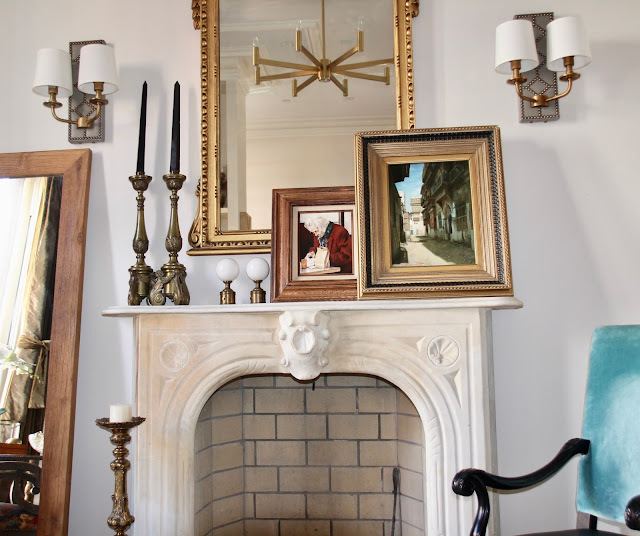 For some time, I have intended to post the dramatic before and after photos of our recent townhouse renovation in Brooklyn Heights. But, I had a problem. I neglected to take proper photos of the project before I began. So I don't have the absolutely essential and melodramatic before pictures. What the heck was I thinking? Anyhow, now that our renovation is complete, and we are fully settled into the space, I will attempt to show the transformation. Hopefully the impact is not totally lost on the lack of before photos. The kitchen, as it appeared when we purchased our house in Brooklyn last year. I think that is one of the contractors I interviewed standing at the window. Most of the work that I did in our new/old house was performed on the parlor level. When we bought the 1800s brownstone in this historic part of Brooklyn, the entire interior of the house was painted a rather dated, and utterly drab olive green. Most of the original detail was stripped from the house and in its place were contractor quality fixtures. While the house did have some warmth, and good bones, it seemed dark, depressing, and didn't fit with the historic surroundings. Simply applying a brighter, fresher coat of paint throughout the house (recommend Farrow & Ball's Slipper Satin), and popping in a few period fixtures and details would have done wonders to the look and feel of the building. But, that wasn't enough for me. Clearly, I was in the mood for something more -- I was ready for a big renovation! Since we cook nearly every night and entertain friends almost as much, the kitchen was the priority. It needed to be comfortable, yet elegant; stylish, yet functional. And it needed to accommodate many cooks in the kitchen at the same time. Thus, it needed two sinks, two ovens and multiple burners. Thank you Thermador! 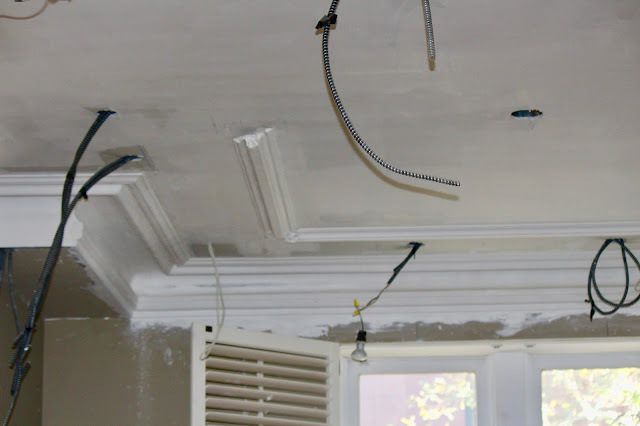 We hired an amazing "old world" plasterer, who worked for months with casts to recreate plaster moldings, similar to the ones that would have adorned all of the townhouses in our area. When we bought the house, the cabinets were only three quarter height to the ceiling. So the entire kitchen area felt truncated, short, and small. The original height and grandeur of the building was stolen away; the enviable ceiling height was lost! I needed to fix this! And I did! I designed the cabinets to be dramatically higher, to the ceiling actually (I now use a ladder for the hardly used, stowed away pieces in the top cabinets). 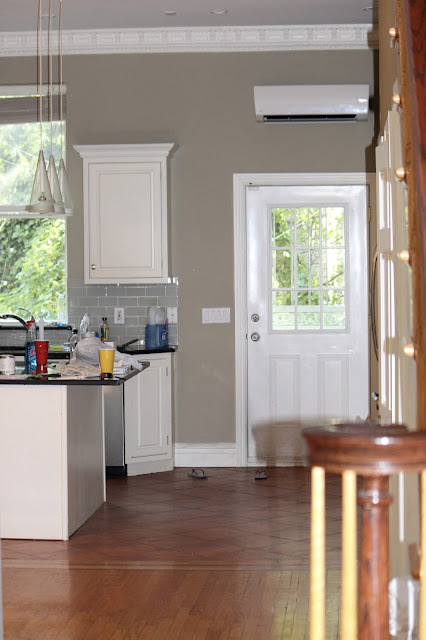 I also mixed painted cabinets on one side of the kitchen with dark stained oak on the other, to give the room depth and variance. I always advise building cabinets to the ceiling, no matter how high. This brings the room up, elevates the eye, gives the room air, and makes everything feel expansive and majestic. For this project, the high cabinets did all of this and more, bringing distinction back to the room, and life back to the house. Former rear kitchen door, which is now replaced with one nearly twice as high. For this project, I also reconfigured the rear windows, bringing them up almost to the ceiling, making them even at the top. This was actually the original builder's intention. A previous owner took their size down, presumably to cut costs. 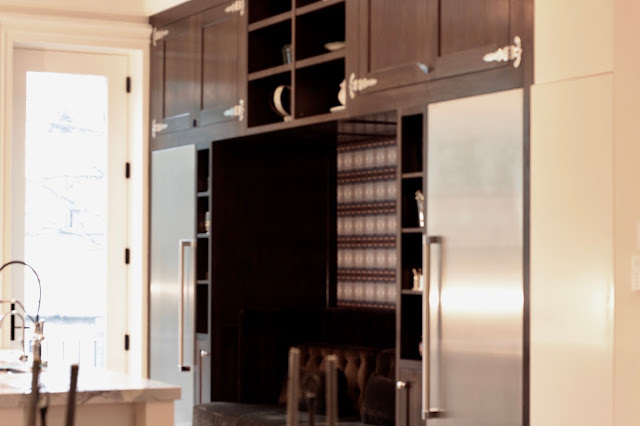 Again, like the cabinets, tall windows and doors help to bring the room up, to let the entire space breathe. The before (above) and after (below) pictures show the pleasing difference. And yes, that is a large brown mohair sofa, sandwiched between the refrigeration units in the kitchen area. I am done with uncomfortable and unwieldy counter stools. 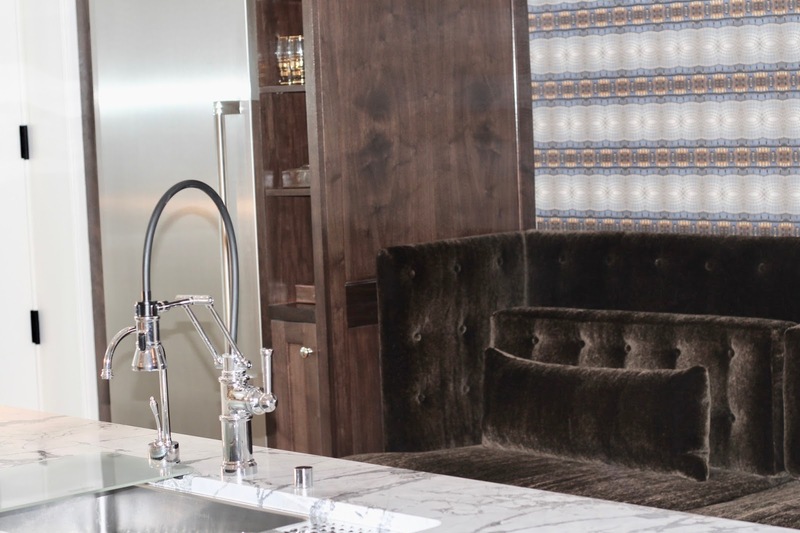 Kitchens, and the guests that enjoy them, deserve all the joy and comfort that comes with a sofa! What was once a dark, unappetizing kitchen, is now bright, expansive and utile. It's a pleasure to cook and host parties in this resurrected space. We all love it! 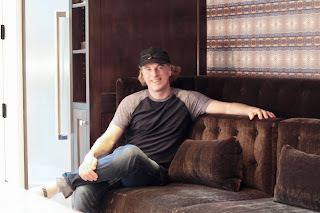 A tufted mohair sofa is the backdrop in our kitchen. 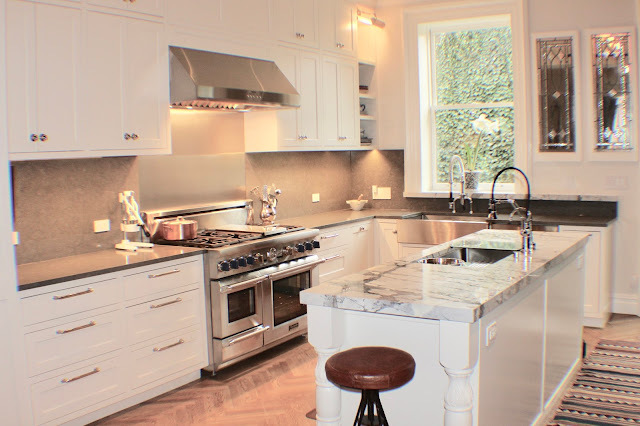 I picked Italian "Ponte Vecchio" marble for the center island. ...so off it went to the salvage yard! 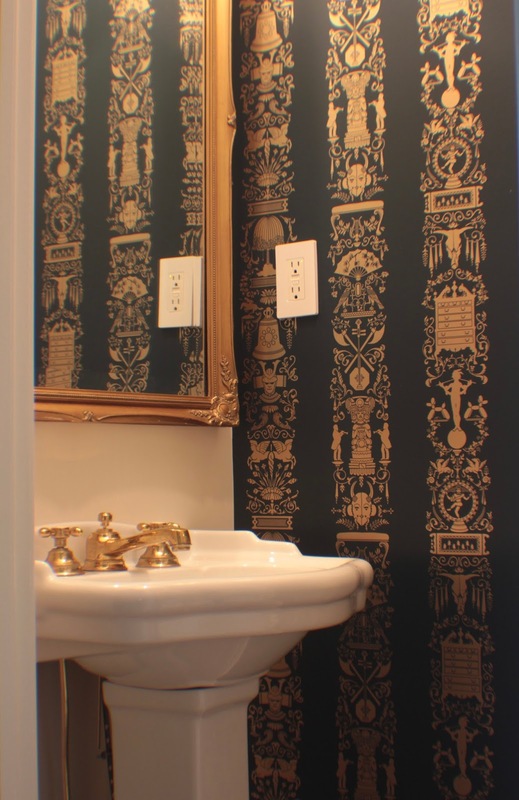 In its place, I installed a period-appropriate sink (from Simon's Hardware) and a gilded mirror, and I pasted up some traditional wall paper. But, don't be fooled! On closer look, the paper is not actually that traditional at all! It's from the amazingly innovative and popular Brooklyn-based wall covering genius' at Flavor Paper. Flavor Paper produces hand screened or digitally printed paper and is made to order. So the colors can be interchanged and the images are completely customizable. For our wallcovering, we choose traditional colors and format, but the images are silly and somewhat controversial. There is an image of the poodle, for example, that is actually in the form of campy balloon art. And the Pegasus', standing guard over a guillotine of all things, have breasts! We give our guests something delightful to look at and ponder while they are taking a moment in the restroom! 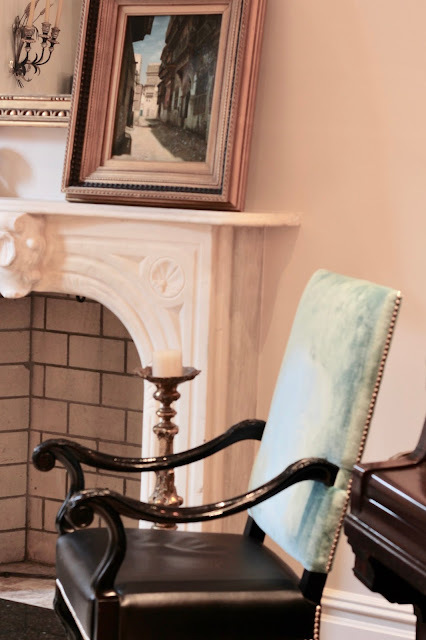 Below is one of the few period details in the house that has managed to survive its many renovations -- the living room marble fireplace. It's fairly simple and not unlike many others in the neighborhood, but it is very sweet and grounds the living room. It's charming. But, it definitely needed some dressing up. Finally, while there are many more elements that were updated, switched out, and modernized in our new/old Brooklyn townhouse, the renovated newel post and stairway is my self proclaimed crowning achievement. 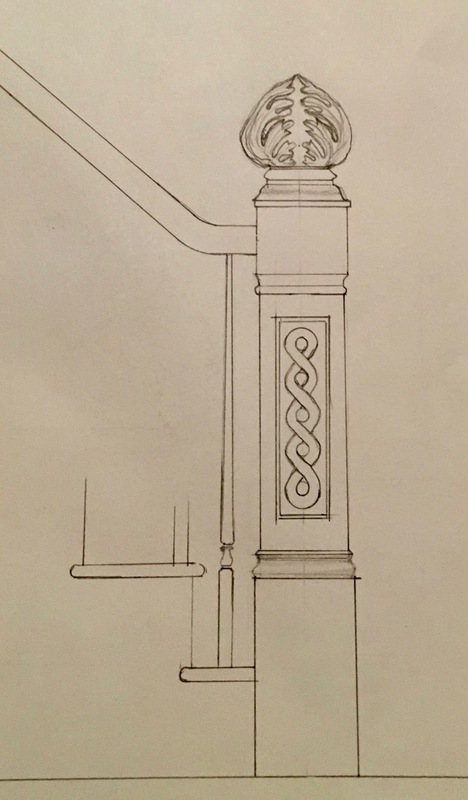 The newel post, seen immediately upon entering the house, was inherited from a previous makeover. It was contractor grade, did not represent the history of the house, was feeble looking and exceptionally dated. It needed to find a new home, immediately! I hired a local wood sculptor, seasoned in the art of making newel posts that were fashioned after the decadent posts of yesteryear. We labored over many designs. 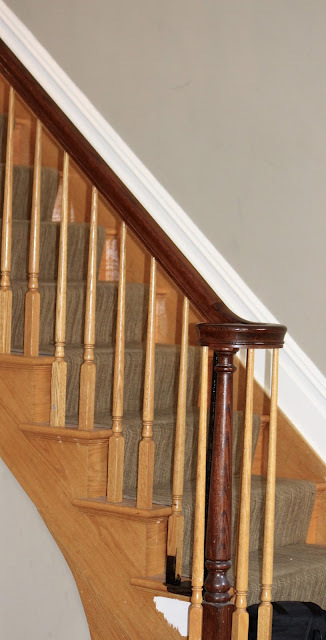 Weeks later, after painting the spindles Farrow & Ball's "pitch black", and the risers a sophisticated mayonaisse hue, we had a entirely reshaped, elegant entrance stairway. It's gorgeous, wouldn't you say? Where have all those specialized craftsmen (and women) gone? That's all, for now! There are many more updated features to this project which I hope to bring to you in future posts. But now, I need to get to work on dinner, in my wonderful new kitchen! Have a great day! get up and make dinner.